Curd/plain yogurt is a dairy product obtained by curdling milk with an edible acidic substance such as curd itself or lemon juice or vinegar. When milk ferments into curd,40% of the lactose becomes lactic acid, which is easier to digest. Further,100 gms of curd contain 49 gms extra calcium as compared to the same portion of milk. Recent studies also show that Vitamin B complex is an important nutrient for the female reproductive glands and since curd is rich in these Vitamins-It is highly recommended for women. The time taken to curdle also varies with the seasons, taking less than 6 hours in hot weather and up to 10-16 hours in cold weather. Take a clean vessel, add milk and bring it to boil. Boil milk without adding any water to it. Once it is done, remove from heat and allow them to cool. 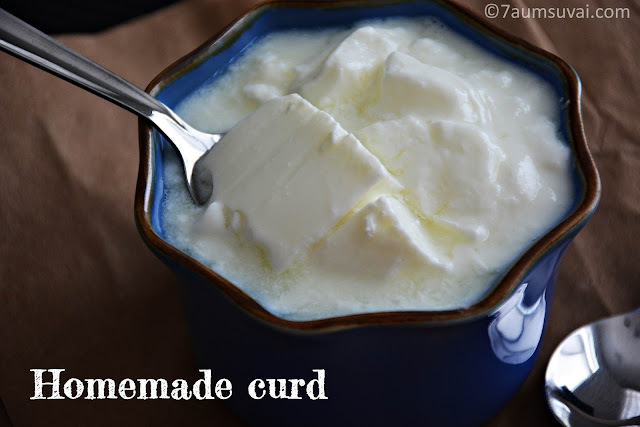 When milk reaches lukewarm temperature, add a tbsp of curd to it and mix well. Cover with lid and keep it aside in a warm places like oven with light, hot backs, near warm stove etc for about 10 –12 hours or over night. Thick and yummy curd is ready. Always use clean vessel for boiling milk as well as setting curd. If you are not sure about the vessel’s cleanliness then try to boil water in that vessel before boiling milk. Because boiling water helps killing any bad bacteria available in vessel. Temperature of milk should not be too hot or too cold for setting curd. It should be always lukewarm. I always prefer using silver vessels instead of plastic boxes for thick and healthy curd. 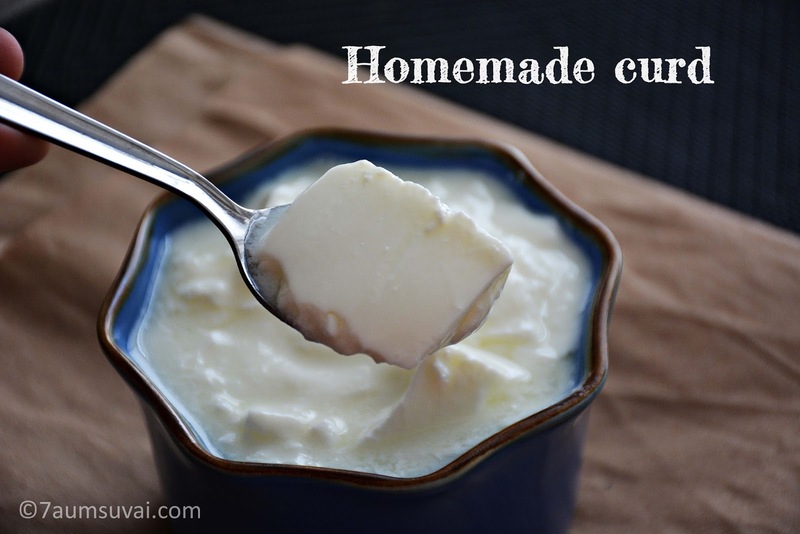 Try to use homemade curd culture instead of store bought one for perfect and tasty curd. happened to visit your blog recently.Nice n clear presentation. 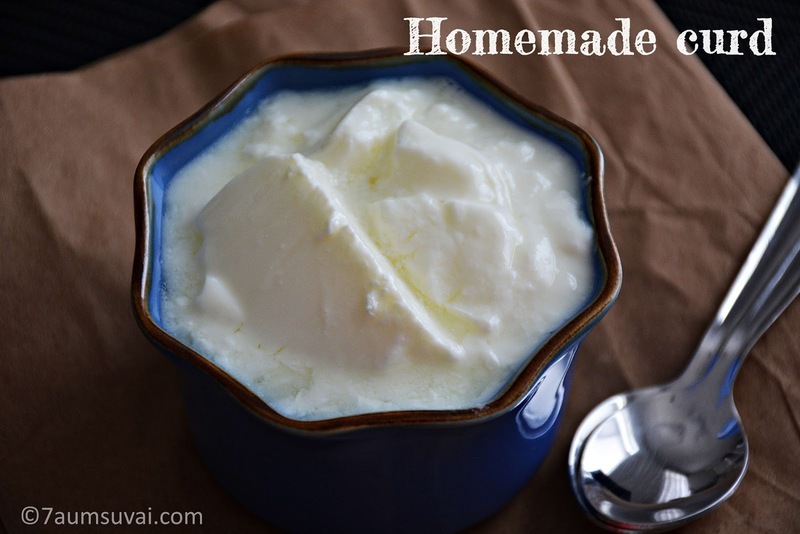 I would like to know the milk and curd brand to make my first batch of home made curd. I used neilson milk wth astro curd but it was sticky n didn't taste good. Hi,happened to visit ur blog recently.very nice and clear step by step presentation. I would like to know the milk n curd brands that I can use to make home made curd.I used Beatrice,neilson with Astro curd but it turned out slimy and didn't taste good. Any 2% or whole milk should work only the culture makes the difference. I used Indian culture from my friend. Even i experienced the same problem when i used astro curd but my friend recommended me to keep on using same astro curd for 3 to 4 times over the time you will get the good texture.